Pay online with PayPal or your credit card using the button below, or download the order form to arrange payment by check or money order. The project Power of the Spirit – A Portuguese Journey of Building Faith and Churches in California, has been several years in the making. Through the effort of our volunteer researchers, this much anticipated publication documents the odyssey of a people and its courageous clergy in a conjugation of effort of epic proportions. 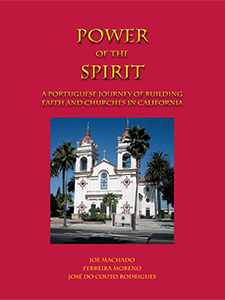 Such effort was essential to construct the Church buildings and assemble the priests who would provide the much needed spiritual support to the Portuguese immigrant community dispersed throughout the vast California territory.